Fun in the sun is the focus of the Aquamarina Beach Resort which has a sprawling pool and direct access to a private beach. our guests enjoy lots of daily activities and bright rooms with private balconies and free Wi-Fi. Looking a bit like a sand castle rising above its own private beach the six-story resort has stunning views of the Caribbean Sea. Just outside you'll find an enormous swimming pool with a swim-up bar and two hot tubs hidden in the greenery. Dressed in tropical colors the 172 rooms and suites have sliding doors that lead out to fully furnished balconies with expansive views. You can expect cable TVs free Wi-Fi connections and in-room safes. Kids love the playground basketball court and miniature golf course. With a snack bar two restaurants and three bars there are plenty of options for dining and drinking. Room service is also available. Parking is free. 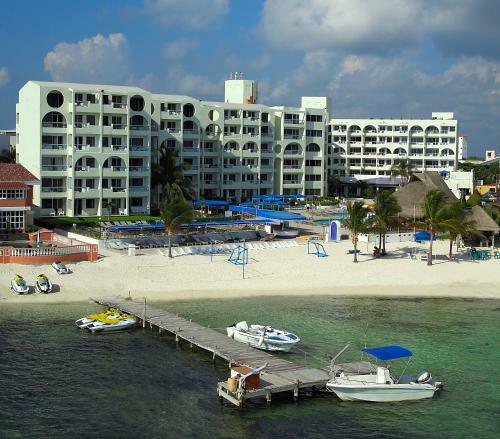 The hotel is at the entrance of Cancun's Zona Hotelera one of the world's most popular vacation destinations. It's minutes from the simple eateries in and the glittering restaurants along the beaches. Shopping malls and golf courses are also nearby. The Cancun Convention Center is just over three miles east. Cancun International Airport is 13 miles south.